The WGC-CSHD Series Heavy Duty worm gear clamp has a four-piece construction featuring a 9/16" wide, 300 series stainless steel band and housing with a carbon steel 5/16" hex screw. The WGC-SSHD Series version has the same construction, but uses a stainless steel screw. The Quadra-Lock housing design eliminates the risk of seam separation and provides more even sealing pressure. 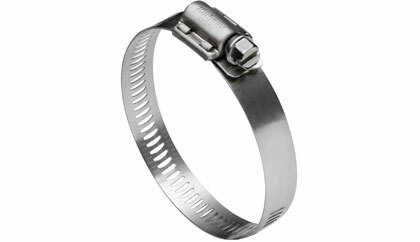 The arched, perforated slots offer added band strength and combine with the hex screw’s sharply defined hex angles for increased torque strength. Click here for more info.